The perfect gift for any auto enthusiast! 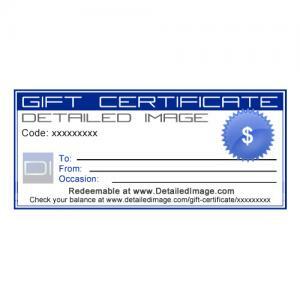 A Gift Certificate to DetailedImage.com is the perfect gift for any car lover. We have a large selection of car care products to choose from and many new ones coming in all the time. Gift Certificates can be applied to any item on the Detailed Image site and can also be used towards shipping and tax if applicable! After purchasing the Gift Certificate, you will instantly be emailed a link to it. Simply click on the link and you can print out your gift certificate in just seconds. You can also e-mail the gift certificate to your desired recipient, making it the perfect last minute gift. Gift Certificates come in any dollar amount you prefer, just change the value from $1 in the amount field to whatever value you would like. If you are purchasing only a Gift Certificate, you will not be charged any tax or shipping, just the dollar amount of the Gift Certificate. Please note - You can only purchase one Gift Certificate per purchase. Gift Certificates are electronic only, you will not receive a physical paper copy of the Gift Certificate. The email that you receive after checking out will provide you a link to a page for your certificate where you can print a copy if you like. You can also find a link to your certificate directly on your Detailed Image My Account page. When you are on the checkout page it will look like you are receiving multiple $1 gift certificates. For example, if you are looking to purchase a $25 gift certificate it will look like you are purchasing 25x $1 gift certificates. This unfortunately is how our system needs to work, but you will ONLY receive ONE gift card for the total value you are looking to purchase (ex. $25). If you have any questions about the DI Gift Certificates please do not hesitate to contact us! I bought this as a Christmas gift for my sister. I'm sure she's going to love it since she orders all her detailing supplies from you guys. Thanks! Excellent process with the DI gift card. Instant notification and funds avaiable to the giftee immediately. Will be purchasing more gift cards in the future!